Because her desires don’t conform to societal norms, a woman in Singapore is conflicted and unhappy. The Masters encourage her independent thinking. Negativity abounds in the life of a UK woman, and the Masters help her understand its origin and how to change it. A correspondent from India gets only negativity at home, leading the Masters to urge self-love and following one’s own path. We hope that today’s advice from the Masters will help all our readers to see how they can turn the negativity in their own lives into positive learning experiences. QUESTION: Masters it has been many years and I’m still stuck. I wondered why people are able to go through the normal way of life. Find a guy get married and start a family? I can’t imagine nor accept this way of life. While I’d like to lead a different life by throwing the towels going somewhere on my own, I realize I have no courage. If so, I should follow the crowd in the way of life. What good am I? ~Happy, Singapore. ANSWER: What is normal? Since every soul chooses their own path, how can there be a normal? The term is used by judgmental society to rate and grade citizens and encourage them to comply with what society thinks is the way things should be. On the spiritual journey, there is no right or wrong and there is no normal. A soul may wish to experience a life where they are only concerned with learning who they are and what powers and abilities they possess as a piece of Source. That doesn’t require that they even acknowledge anyone else sharing the planet with them, and they may never need to interact with others. Families are the way society propagates. People are taught that reproducing themselves is normal because society would cease to exist if no one had children. But if everyone participated in that model, then no soul could learn about homosexuality, transgender love, or abandonment and loneliness. These are all valid life lessons and are outside what society would say is normal. Following the crowd is saying that they know more about why you came to Earth than you do. How is that possible? Did they plan your soul’s journey for you? I don’t think so. Do what feels like something you can learn from. Explore the possibilities. You can do anything if you have faith that you can. Stop being so negative. Decide what you would really like to accomplish. Spend some time figuring out the way to do it, and then take one step at a time toward the goal. Everything is a choice, so if you think you can’t do something, you never will be able to do it. Allow yourself to love yourself enough to bring your dreams to fruition. QUESTION: Masters I want to know why I am finding living in this world very difficult? I can’t come across positive people – every single person in the family and outside the family is rejecting me and most of them are bullying me and I am finding it hard to live. Why is this happening to me even though I have done no wrong to them? ~Humaira, UK. Rita from Portugal asks the Masters: I finished my law degree and now I started to practice law as a trainee lawyer. The problem is that I'm not happy with what I do. I really want to give up but at the same time I'm really scared because I don't know what to do next. Am I refusing what I am supposed to do, or this is a chance to choose another path? Answer: There are no “supposed to dos” in anyone’s life. Everything that you do is to learn something about yourself. There are many things that can be done with your training; you have just chosen an employer that does not suit your personality. Look around for other possibilities within the field. You like to help people, and there are associations who specialize in that. Sheila from the US asks the Masters: My sis in law has voices that sound like gruff men that she speaks with as she sleeps. There are also other voices. Are these earthbound entities? Are they harmful? How can they be released? Answer: Your sister-in-law is traveling during her body’s rest cycle, which is normal. 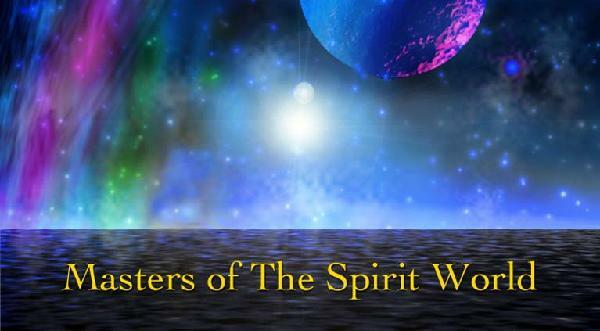 Most of those with whom she is in contact are from the spirit world. Occasionally a discarnate tries to intervene as she is just going into the spirit world or returning from it. She is in complete control and can tell them all to leave her alone if she desires. She can also limit contact to times when she wishes to interact with them. If she shuts it down completely, she may find it difficult to reinitiate it later. The only ones that are potentially harmful are the discarnates. She can ask her guides to keep them away before she goes to sleep. GN from Brazil asks the Masters: Please help me to understand my difficult feelings with my family, why is it so hard for me to be with them? They treat me well, I don't blame them, but I can't love more and I never want to be with them. Family meetings are so hard, always feels like duty. How can I make this easier? Answer: Ask yourself why you feel the way you do. Sit in meditation and see what the answer is. You do not feel worthy of their love because you do not love yourself. They don’t expect anything from you but your presence. If that is too uncomfortable, remove yourself for a while and see what does make you happy. You choose how you feel about things, so take the time to examine your desires. Roger from the US asks the Masters: In high school I saw this girl for the first time in my life and immediately felt like I was in love with her or felt a connection with her, I was never able to talk to her throughout the 4 years of high school because of my terrible anxiety but even after being done with high school 2 years later I can’t seem to stop thinking about her and being in love with her. She is always on my mind and it’s dreadfully painful because she now has a boyfriend and I can’t do anything about it. Could she be one of my soulmates and will I at some point in my life meet her again to engage in a loving relationship? Melody is her name. Answer: You created a fantasy world around this woman. She is a soul mate of yours and you have had several lives together. She is in this life for you to see if you can develop your self-confidence and self-worth issues to the point of approaching her for friendship. If it goes any further than that, it is up to the two of you. Beth from Portugal asks the Masters: It has come to my attention that there are still some deep questions within my subconscious mind (and heart) about my mother that I should heal. Can you tell me what and how to release this burden? I feel the time is now. Answer: Just telling you will not help you heal. To settle this energy, you must go back to the contacts and work through the anger and hurt. You can do this through bringing up your childhood in meditation and watching it replay. Feel each incident and find out why you still feel so strongly about the way you handled the situation. Remember you were a child and didn’t think you had a choice. Now you know you do have a choice about how to deal with this. Let go of the guilt and shame and claim the beautiful person inside as your identity. Love yourself for all that you went through. Tammy from the US asks the Masters: My Mom Nina died at the age of 59 from Heart Attack. I had not seen her in years. She suffered schizophrenia in this life. Is her spirit at a higher level for choosing to live such a life? Is she with my Grandmother or did she reincarnate? Answer: Neither has reincarnated yet. Your mother chose difficult lessons for her life because she wanted to see if she could work her way through them. At the end she understood that she did not really need to experience mental illness, and that was why she left when she did. Lessons are lessons, and the accomplishment of trying them doesn’t have varying levels of achievement. All lessons are just lessons. Your mother is sharing time with some souls whom she knew in this current lifetime, your grandmother included. Ana from Brazil asks the Masters: I've been in a relationship for 4 years with a man who sometimes looks like the man of my dreams and sometimes it seems abusive to me. I wonder if I should persist in this relationship? Am I the problem of the relationship? Answer: This man has a personality difficulty. If things are going his way he is a model of decorum, but if they aren’t he is a tyrant trying to control the world. This is a lesson for you in how far you wish to go to get what you want. There are no right or wrong decisions. Ask what you truly want and don’t let him, or anyone else, make your mind up for you. There are plenty more men out there for you to meet. Nari from India asks the Masters: My brother is going thru very tough time in India. His wife cheated on him and even tried to plan to kill him. But law is still her side. She is winning everywhere. I am trying to help my brother but don't see any ray of hope. He doesn't want to live in India anymore. You think my brother and his kids will have a successful life in the near future without his wife? Answer: Your brother is not telling you the whole story about what has been happening. He has to decide what he sees his future being. Each party here has brought the actions into their life for the purpose of learning. The kids are very connected to their mother and would have some difficulty being cut completely off from her. Your brother needs to get rid of his anger to defuse the situation. The parties are not communicating and that is the only way to work things out. Erin from the US asks the Masters: What is my purpose on Earth? Answer: The same as all other souls – to understand who you are as a soul and to figure out what wisdom can be obtained through the lessons you chose to experience in this lifetime. Work on seeing what lies behind your fears and doubts. Neet from Canada asks the Masters: I am waiting for the miracle to happen. Is it coming? Will my prayers be answered before the end of 2018? Answer: You already know that answer. Why do you expect that you will deserve a miracle? Have you been working to produce one? Do you have the faith in yourself to create one within your reality? Every soul creates their own reality, so better reinforce your desires. Kristy from Australia asks the Masters: What do you see me doing or working as in the future, where do I start? Answer: We see you doing whatever it is that you decide to do. Things are not pre-ordained. Things happen in your life because of the choices you make – not because someone else set up a schedule for you. It’s like wanting to be a triathlete but never learning to ride a bike, jog, or swim. You have to prepare for a future. Nancy from the US asks the Masters: What lesson was I, and are others, to glean from the death of a child. My daughter was called a suicide but I have doubts and am stuck in a loop trying to solve the mystery while soldiering on in a life less joy filled. Answer: There is no one specific lesson from this horrendous occurrence. The departure can be a lesson for the soul alone or a group lesson for those who remain. Suicide is a way for some overwhelmed souls, those who have chosen to experience more than their human bodies could endure, to return Home and start all over again. Regardless of the cause, your human daughter is no longer on the same plane as you. Make a connection, through the ether, with her so she might comfort you and help you feel the love she has for you. 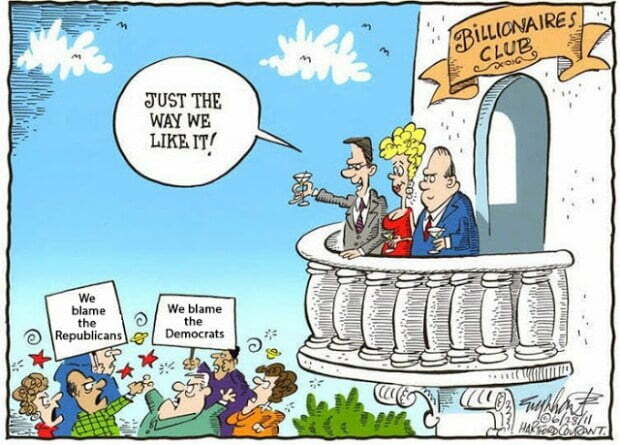 The Ruling Elites Love How Easily We’re Distracted and Turned Against Each Other. Posted February 1, 2019 by Edward Morgan. Let’s say you’re one of the ruling elitesoperating the nation for the benefit of the oligarchy. What’s the best way to distract the populace from your self-serving dominance in a blatantly neofeudal system? Right elites take the bread out of the non-elites mouths by coopting non-elites on the right with the circuses of religion and nationalism. At the same time, the left elites have done the same by coopting left non-elites with the circuses of political correctness, multiculturalism, etc..
None of these things – religion, nationalism, political correctness, multiculturalism, feminism, anti-racism, etc. – are necessarily bad in themselves, particularly in moderation. However, to distract people from having the economic wool pulled over their eyes, they need to be amped up into a public shouting match, which is what we see happening in media outlets controlled by, you guessed it, the elites. However, the stateless super-rich of the New Left-Right Elite Alliance no longer need to buy off the non-elites with money. They have no fear of the pitchforks because they can flee behind bodyguards (private armies as in the Middle Ages are coming) or gated communities, or they can flee the country in an instant if they need to, taking with the large chunks of their wealth, which is now either offshore or mobile thanks to international banking. They have become insulated from the consequences of their policies. The non-elites are mad as hell, but don’t know exactly where to direct their anger, because the social and cultural issues the elites have used to co-opt the non-elites are also incredibly effective at keeping the left and right non-elites in a constant state of anger at each other. The Elite’s greatest fear is that left and right non-elites realize who their real enemies are, and that their fighting with each other over cultural issues is what the Elites want them to be doing. The era we’re entering – a disintegrative winter – lends itself to discord and the decline of common ground, as I addressed two years ago in A Disintegrative Winter: The Debt and Anti-Status Quo Super-Cycle Has Turned. 5 Tools to Stop You Worrying. By Cherie Roe Dirksen, Conscious Life News. Why Do We Worry So? When it comes to concerns about life’s uneasy or potentially disastrous situations, we start to worry. I don’t think there is a single person in this world that hasn’t experienced a copious bout of the collywobbles in their lifetime — but why do we do this? Now, if we actually look at this list from a transpersonal point of view — we take ourselves out of the equation and are impartial — these worries are not only a waste of precious manifesting time but they are a reinforcement of nonconstructive potential timelines. Just remember you bring about what you think about the most. This is not meant to scare you, it’s a preparation tool so that you can steer your thoughts to more positive neurological pathways. When you reinforce encouraging situations in your mind, as opposed to harmful scenarios (aka worrying), you are creating potential for a more fruitful future. I’m going to take a stab in the dark and say ‘no’ it probably hasn’t, right? So, what can you do now to alleviate any future concerns you have? Swap worrying for doing. Can you actually do something about it now? If the answer is yes, take those first steps and you will begin to lighten the load off your mind. Even if it means writing the problem down. Just getting it out of your head and onto paper can be a relief. You can even then burn the paper or trash it symbolizing your new stance on worry. Tell your troublesome thought who’s the boss! The best thing you can actually do is visualize what you DO want to happen — I can’t stress this enough. Map out a possible solution. Again, it’s always helpful to write it down so that your mind is free of it. When you can look at some achievable solutions, you may gain a better perspective of how you can change or alter the course of your quandary. Remember to focus on the desired outcome. If there is absolutely nothing you can do, then try acceptance of what is. If you cannot change what is, you need to let it go and find peace within your situation. How has this situation affected your life? Is there any diamond you can mine from it? Hint: there usually always is a positive learning when you can train yourself to see something from an alternative perspective. Solutions will present themselves when we quiet the mind. There is a wealth of information just waiting for you to tap into when you are in a meditative state. Clearing your mind of what I like to call ‘mind-static’ (continuous loops of mind chatter — read related article: How to Stop the ‘Monkey Mind’ Phenomenon) will help you to excavate that pearl of truth and gain a lucid perspective. When you step out of the way — solutions can come in. Your higher self never gives you any challenge that you cannot conquer. Remind yourself that what you think you attract. Do you want to attract more of what you are worrying about? If not, then switch to thinking about what you do want to manifest in your life and let all negative outcomes go — you don’t need them. Capeesh! The mind can be trained to think differently — you are 100% in control of your destiny. You have a choice to rewire your thought process to align with what you want to manifest — don’t let anyone tell you otherwise. Don’t fall into the trap of being a ‘victim of circumstance’ — this state doesn’t really exist as you create everything and only you can give it the necessary potency. Playing any kind of victim role is a disempowering stance that you should avoid at all costs. The art used in this article is called ‘Gilted’ and was part of my solo exhibition called ’42’ (you can download the FREE book of art and poems HERE). Spend time doing some effortless activities. When you consciously choose to set aside time to just be in the moment and go with the flow, find solitude or sanctuary, you will find that you feel clearer and better able to make decisions and choices. In other words, it helps you keep a clear head so you can tune in. It is important to take time or make space for you to just be with you and be you. This is the best way to safely explore all of your ideas, thoughts, and feelings. Do something over the next few days that allow you to just be, without the noise of the world and feel free to explore who you really are at your core. 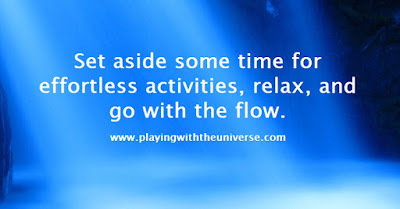 Thought for today: Set aside some time for effortless activities, relax, and go with the flow.